[Update]: Twitter has apologized for the gaffe with poster.“I’m very sorry for this. It’s not relective of our views. We took a private photo with a gift just given to us — we should have been more thoughtful,” Vijaya Gadde, Global Head of Legal, Policy, Trust and Safety Lead at Twitter, tweeted. “Twitter strives to be an impartial platform for all. We failed to do that here & we must do better to serve our customers in India,” she added. Twitter CEO Jack Dorsey visited India earlier this month on a week-long trip and talked about his entrepreneurial journey, how the company is working to curb fake news and promote healthy conversations as the 2019 elections inch closer. However, Dorsey’s visit has also stirred up a storm after he was clicked holding a poster which said ‘Smash Brahmanical Patriarchy’. 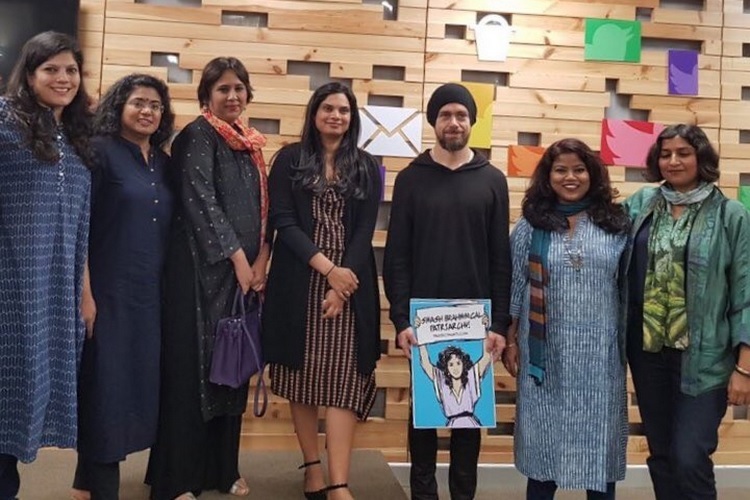 Following a closed-door discussion with some journalists, activists, and members from Twitter India’s team, Dorsey posed for pictures holding a poster which didn’t go well with some sections of Indian social media. Critics accused Dorsey of insulting an ethnic group which has been integral to the Indian culture and demanded an ‘unqualified apology’ from him over his grave error. Others questioned why would the head of a global company like Twitter express such insensitivity towards a group and hurt people’s sentiments, while some even went on to call it a propaganda hatched by the ‘far-left minds’. Infuriated users also questioned Twitter’s policies and asked how the company tolerates something which plants the seed of discord and disturbs social harmony. Eminent figures like former Infosys Director T. V. Mohandas Pai joined the wave of criticism created by offended people who vented their fury on social media sites. Can a law suit be filed for promoting racial bigotry against Twitter head? Following the backlash, the official Twitter India handle tweeted a short recap of Dorsey’s meeting which mentioned that the controversial poster was a gift from an activist. Twitter India also clarified that it was not an official statement from Twitter or its CEO, but a reflection of the company’s efforts to process all facets of ‘important public discussions’ that take place on the social media platform. Twitter has been in the news lately after data leaked from the company’s office in Dubai allegedly led to the murder of a journalist named Turki Bin Abdul Aziz Al-Jasser. The company, which is battling fake news and hate speech at a feverish pace, also had to issue an apology earlier this month after ‘Kill All Jews’ emerged as a trending topic for users in the New York area.